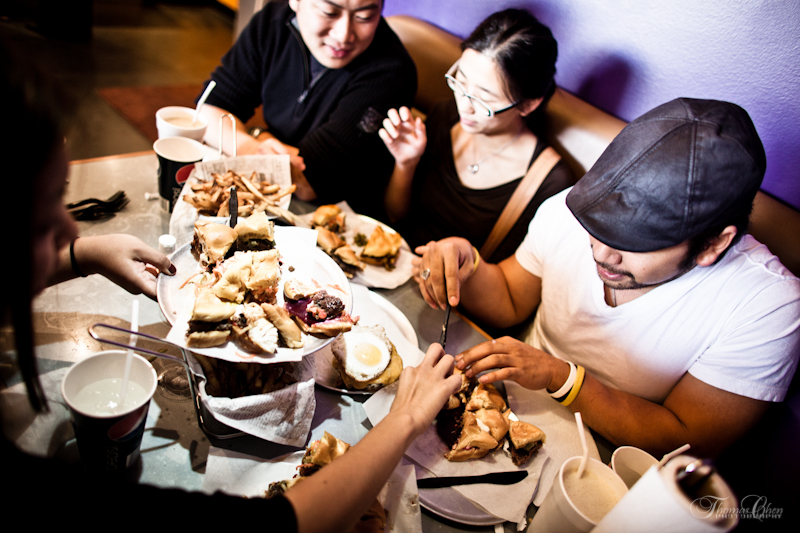 ** All the photos used in this post are credited to my talented friend and eating buddy, Thomas Chen. 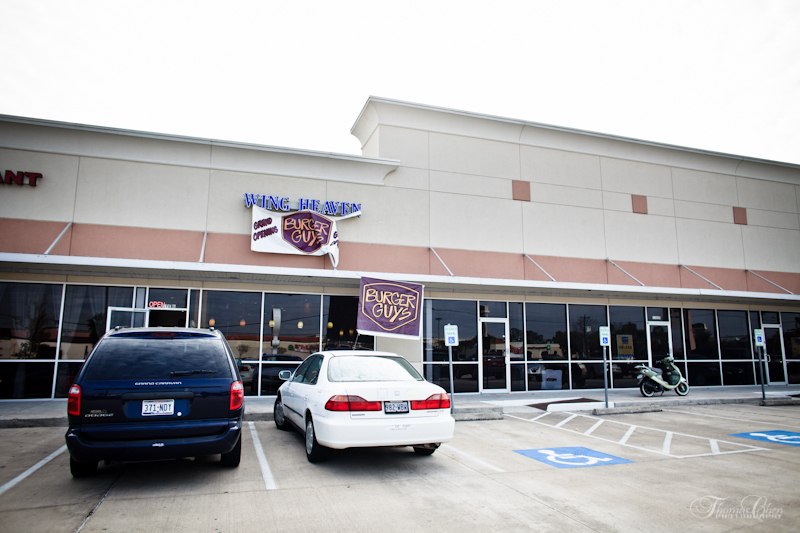 The last time I was in Houston, Thomas’s brother, Willis, founder and president of a Houston eating and events group, Skissors, suggested we eat at Burger Guys. Since Willis never steers me wrong when it comes to eating out in Houston, I didn’t bother looking up Burger Guys before rallying up a small troupe. 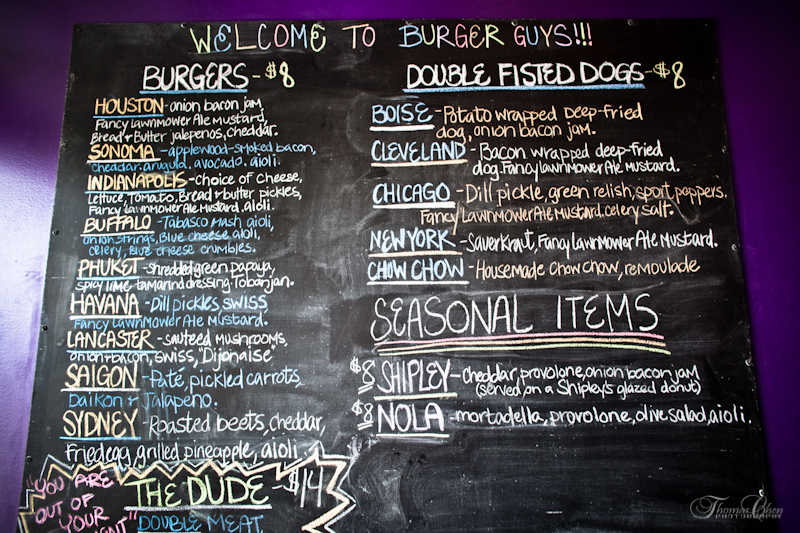 Burger Guys is so new, they do not even have a permanent sign up yet. At first glance of the menu, you can tell Burger Guys, not to be confused with Five Guys Burgers (I keep getting asked, “Do you mean Five Guys?” whenever I mention this place), is a unique burger joint. Unique not only because most of the burgers come with fried duck eggs on top, but also look at the ingredients. Beets and grilled pineapple? Pâté? Pickled daikon? Yeah, baby. I’d say this is a rare gem of a burger joint. Click here for enlargement of menu. 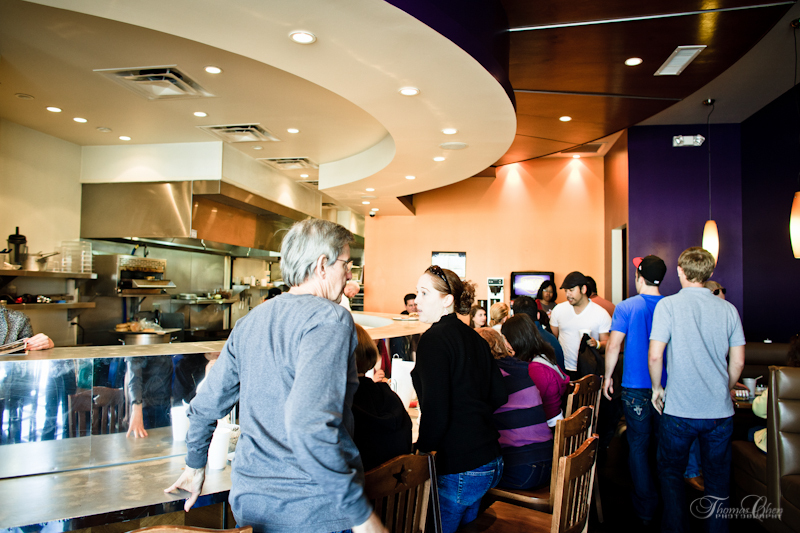 We went during lunch time on a weekend and despite only marketing through word of mouth, this place was packed with regulars. Our party of six squeezed into a booth, three by three. 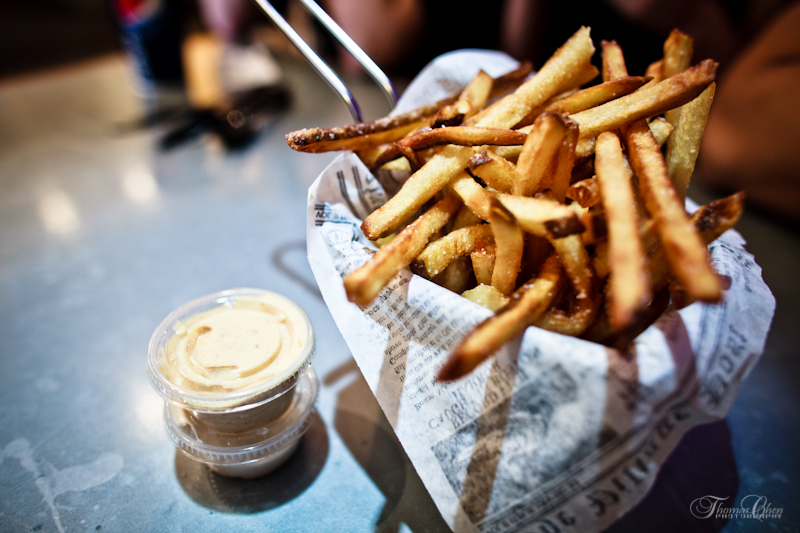 We ordered 2 orders of Duck Fat Fries (yes, duck fat) and 5 different burgers to share. We would have gotten 6 had I not miscounted our party. However, 5 burgers, 2 Duck Fat Fries, 2 milkshakes (Vietnamese Coffee and Salty Caramel flavored) were more than enough for our party. From what I understand, the main criticism of Burger Guys on the street is that it’s too expensive for burgers. I honestly begged to differ. 8 dollars per burger for these works of art is actually a steal. 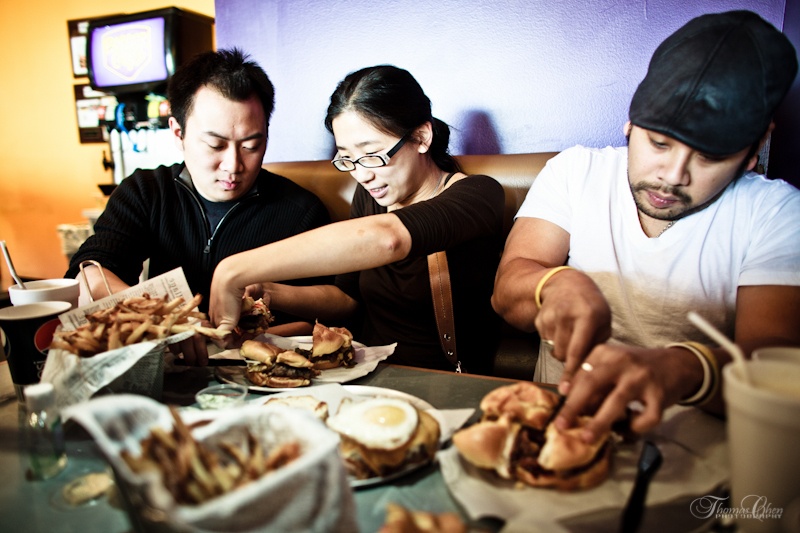 Jason, Cindy, and Willis help cut up the burgers 6 ways. Willis joked that we could all reassemble our pieces to make one burger. 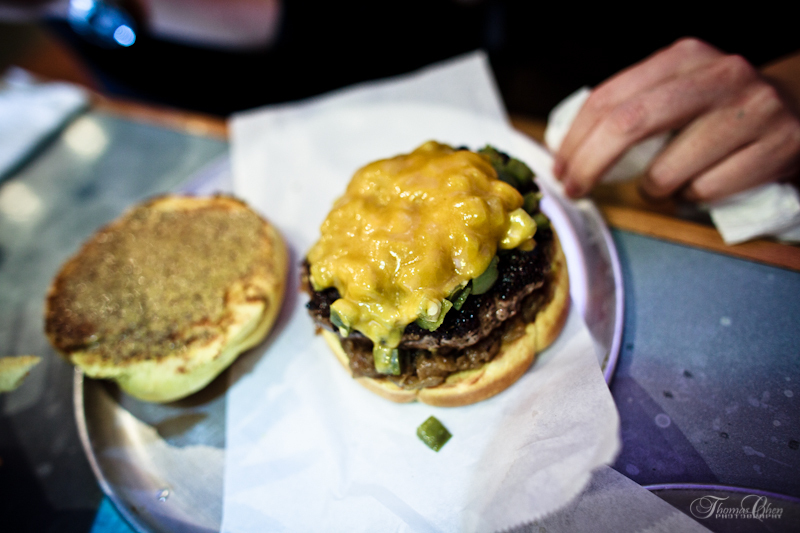 The Houston: onions, bacon jam, fancy lawnmower ale mustard, bread and butter, cheddar, jalapenos. This was a solid burger. 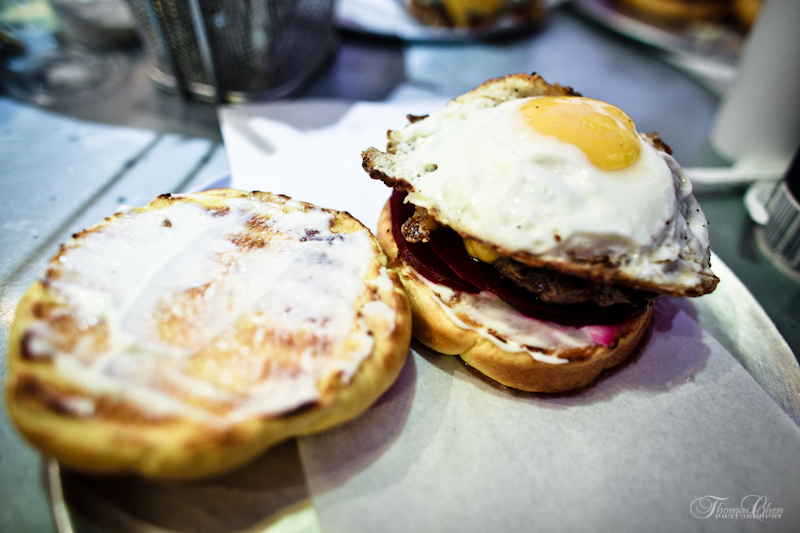 Note it’s also the only burger we ordered without a fried egg on it. It had almost a smoky taste to it and the jalapenos gave it a desirable kick. 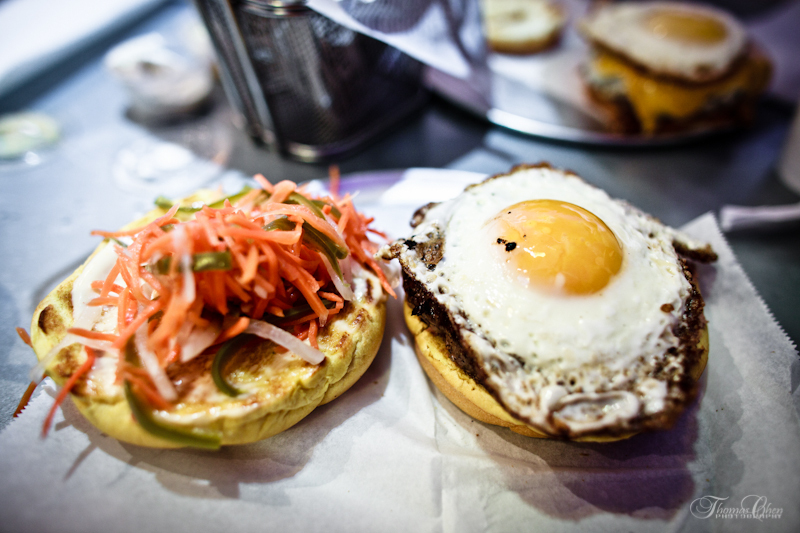 If you like tang and sweet, this burger is for you. As a Vietnamese girl, my palate is partial to the mixing of sweet and sour. We use a lot of lime and tamarind in our food and often balance it out with pineapple or sugar. It wasn’t a big surprise that I liked this burger. Saigon is South Vietnam’s capital city before its fall and it was renamed to “Ho Chi Minh City.” As a fan of banh mi’s (traditional Vietnamese sandwiches), I HAD to try this. Vietnamese lunch meat sandwiches typically include pickled carrots and pickled daikon, and a spreading of pâté. Who knew these same ingredients would complement hamburger meat so well. This burger tied for my favorite. This was my other tie for favorite. Seriously, a pleasurable adventure in my mouth. I love beets. I love grilled pineapple. I love burgers. I love fried duck eggs. Put them all together and you have such an exciting experience and surprisingly the strong ingredients balance each other out. I wholeheartedly recommend this burger. Note the pretty hint of purple in the photo. 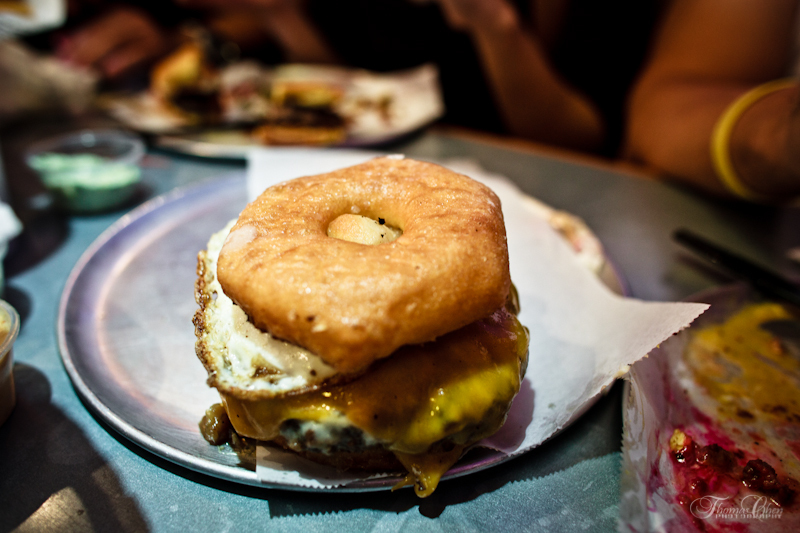 I’ve been stalking a donut burger in Austin for a while at Gibson Bar, infamous for the Round Rock Donuts burger. 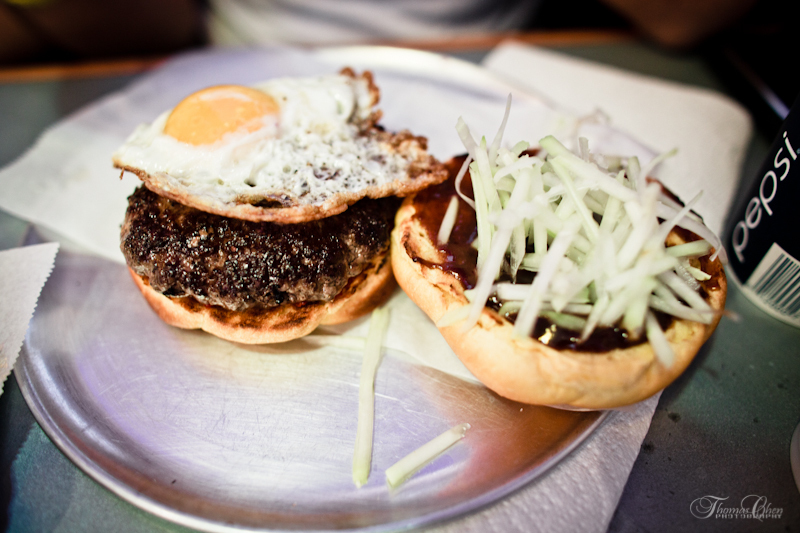 I feel like eating the Shipley at Burger Guys has canceled out my need to hunt down the Round Rock Donuts burger in Austin. I loved Thomas’s reaction to this burger. “This burger tastes ridiculous!” And that’s a fair description for anything that could moonlight on the “This is Why You’re Fat” website. This is a ridiculous burger. For sure. If you don’t recognize that life on earth is a bit absurd and don’t sometimes revel in it, this is not the burger for you. 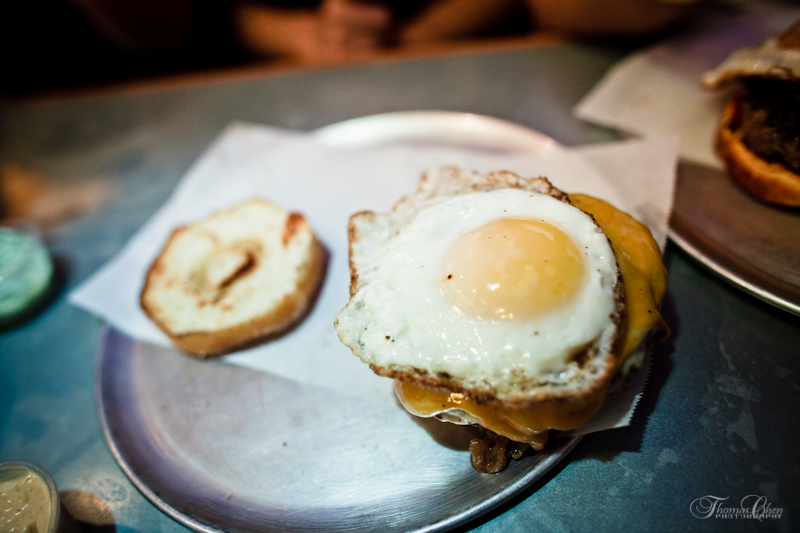 For all you other hedonistic existentialists, please, I invite you, eat a burger served on donuts with bacon jam and a fried egg. 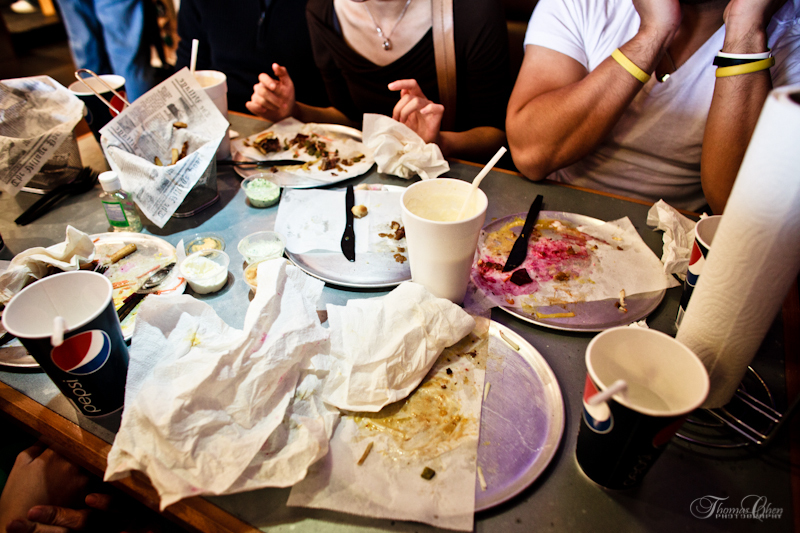 A photo of the aftermath. What a gem of a burger joint. For all the haters who don’t want to shell out eight dollars per experience, don’t. It’ll leave more for the rest of us.